http://www.congress.org “May 26, 2011 GM, I phoned yesterday about this issue of severe WX. Please look at these URL sites and tell me the man is wrong in the forecasts he makes. If believable, why is our government making this WX? NOTE: in the first video of the reference to “Vortex Spiral Radar Rings” in 2004 over New Orleans….. ‘Vortex Spiral’ RADAR Rings – out of North Carolina and Central Midwest http://www.youtube.com HAARP rings appear @ WA, OR, ID, MO, TN, LA, TX, AL, KY, NY = severe in 24-48 http://www.dutchsinse.com To date; many folks have died, flood waters have devastated the mid-west. Why? Now they may be targeting NC & SC? Again why? Serious damage has happened in the past” Katrina” and is still happening in the form of floods and severe storms. If above information is to be believed ( and I do ) still more serious damage to this country is in the near future due to HAARP operations. At the very least, damage that has happened already caused many deaths, scores of displaced residents, unbelievable damage to property, due to floods & tornadoes, that were possibly Man Made. All leading to shortages and higher Food prices. I am requesting a Senate Hearing/Investigation into the Operations of HAARP as to any intentional or un-intentional damage to the US. Please turn a spot light on HAARP and those who are controlling it. Weather modification I should think is serious business. HAARP has that ability. Has HAARP gotten out of control? Perhaps it should be shut down until that investigation is completed. I would like to hear back on this issue. Please tell me I am wrong to think our government is causing severe WX conditions. The EU referred to a parliamentary document issued 13 years ago on 13 March 1999 outlining why the strange frequency of bizarre global weather and geo-tectonic disasters appear to be on the rise and why NATO, the US Air Force and US Navy have been held accountable for their knowledge and shrouded use of HAARP technology. One of the most damning statements in the document reveals an American refusal to account for itself regarding HAARP research. To get back to the viewer in Cullowhee who suggests HAARP’s shutdown, his/her letter is an encouragement to Dutchsinse and other concerned Youtubers, many of whom two months ago were just viewers. Alerted by his short but gripping videos churned out during sleepless night watches scouring radar sites online, a team of benevolent citizens like him, trained in crash course fashion, pitched in to help film or capture screenshots of rain clouds punctured and shaped by evident anomalies such as scalar squares and rings. Experience has showed in the space of 5 months that 24 – 48 hours after the detection of a HAARP Ring or Scalar Square, the epicentre would be hit by severe weather or even an earthquake, so documentation has been based on the notion that “a ring means a threat”. Shocked by the appalling death toll left in the wake of over 875 alleged manmade supercells since April, up to 8000 visitors tuned in to encourage Dutchsinse, WaronerrorDkos and other HAARP sleuths, trying to get the news out. Severe weather warnings based on HAARP beams could not be broadcast on mainstream media because these “avant garde” forecasts would appear to the public to be based on a hunch more than science and would have been deemed “conspiracy cry wolf theories”. In a race against time, forecasters and viewers (including myself) felt helplessly gagged as we saw super cells build up out of nowhere, moving ineluctably across our radar screens to smash into unsuspecting towns such as Joplin on Sunday 22nd May. Luckily some people left in time, like this viewer’s family, who left a message of heartfelt gratitude on Ductchinse’s youtube channel. So far, the only way to peacefully retaliate to these beam attacks has been to observe and record them. Newcomers to the determined and growing movement against dubious HAARP activity are therefore invited by WaronerrorDKos to download on Flickr their own “homemade” screenshots from all available weather sites. It is easy to cotton on by watching previous posts by the team, coached by Dutchsinse, whose generic designed by Animattronics has an illuminati pyramid getting destroyed by a big red heart. He signs off with a comforting “Hang in there folks, Much love”. Two days ago, on 27 May 2011, the Standing Committee acting on behalf of the Assembly of the Council of Europe adopted the Resolution 1815 on the potential dangers of electromagnetic fields and their effect on the environment. Resolution 1815 recommends that the member states pay heed to and protect “early warning” scientists (8.5.3.) and increase public funding of independent research. He commented: MetalSays We need to topple the dopples lol Sorry I know it isn’t funny in the least but I couldn’t resist that one. As I write, the storm from Des Moines is now approaching New York City while another mass of angry precipitation has gathered exactly where I captured a huge ring yesterday over Billings, in Yellowstone County, Montana (where there are earthquake swarms). It says in the Storm Tracking explanations on Intellicast: The Current Radar map shows areas of current precipitation at the national or regional level. A weather radar is used to locate precipitation, calculate its motion, estimate its type (rain, snow, hail, etc. ), and forecast its future position and intensity. Modern weather radars are mostly doppler radars, capable of detecting the motion of rain droplets in addition to intensity of the precipitation. High technology may seem fun and I am still a neophyte, but I echo the person in Cullowhee. Do we really master these tools and are they really worth it? (click on loop) These less sophisticated weather maps showed huge beams offshore on May 13, two days after the deadliest earthquake in more than 50 years rocked the south-eastern town of Lorca, near Murcia, and two days before the start of the “Indignados” series of peaceful protests demanding a radical change in Spanish politics. Perhaps we would all be better off without cell-phone and Doppler towers, Wi-Fi and what have you, and without an incessant, state-of-the-art, all-seeing eye glaring at us and playing God? Are we not tired of satellite images of people dying live on TV and online? In recent years the people along the Zambezi in Zambia and Mozambique have not been quite so philosophical. A missionary who called friends on the phone could hear children screaming as the waters rose too fast, forcing them to flee in panic. The aftermath of the tornadoes in the Midwest has been the rise of the Mississippi, cresting at epic levels and forcing evacuation, the flooded plains putting pressure along the New Madrid fault, which could cause an earthquake of unseen proportions. These unnatural storms must cease. 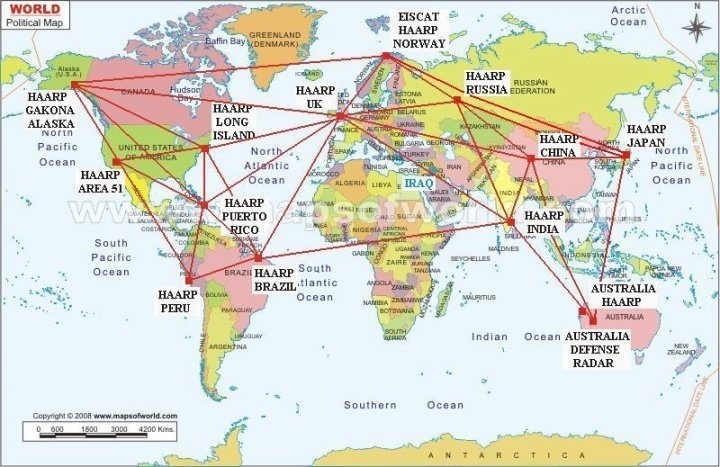 The problem is that there are HAARP installations all over the world. Some are controlled by the USA and some are not. We need to know who is piloting these things. We also need to push to stop the dark cabal…NOW and end their attempts to establish the New World Order. The push for an investigation is a good one, but it needs to go further. Thanks for watching and I look forward to your comments and opinions. The next phase in arming up agains this criminal use of the weather by these nefarious global entities is to figure out how to cancel out these radar beam anomalies using like technology. i appreciate your blog and your desire to document these crimes of genocide as i have been doing, God speed to you for your efforts.